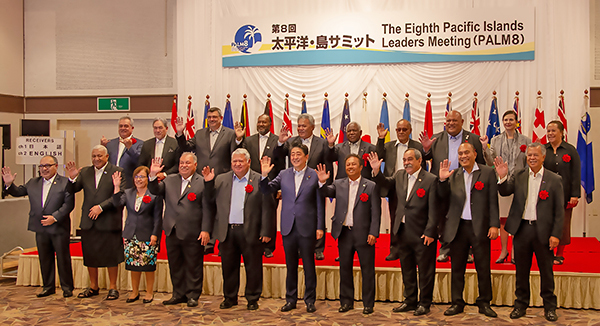 Iwaki, Fukushima—Presidents and Prime Ministers of Pacific Island Countries (PICs) gathered in Iwaki, Fukushima, Japan for the 8th triannual Pacific Island Leaders Meeting (PALM 8). As new full members of the Pacific Islands Forum (PIF), this was the first time for leaders from French Polynesia and New Caledonia to participate in the PALM. The other countries are Australia, Cook Islands, Federated States of Micronesia, Republic of Fiji, Republic of Kiribati, Republic of the Marshall Islands, Republic of Nauru, New Zealand, Niue, Republic of Palau, Papua New Guinea, Samoa, Solomon Islands, Tonga, Tuvalu, and Vanuatu. 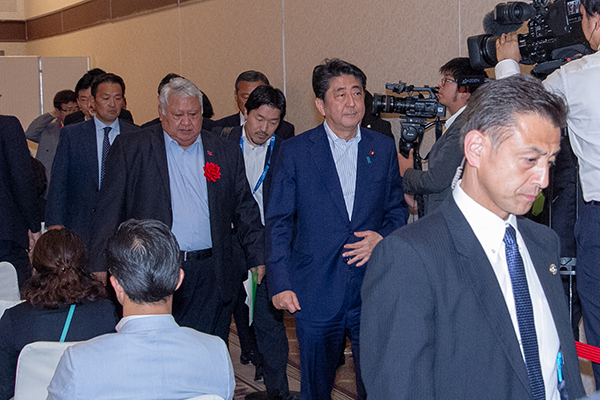 Japanese Prime Minister Shinzo Abe and Samoan Prime Minister Tuilaepa Aiono Sailele Malielegaoi, who served as the co-chair for the meetings held a press conference following the acceptance of the Leaders’ Declaration. They said that the nations had been able to reach a point where they could send out a unified message on a number of topics of mutual interest and cooperation. The Prime Ministers did not mention that the process of pounding out a unified Leaders’ Declaration was not necessarily an easy one. Draft copies of a proposed Declaration had been circulating among the PALM leaders for several months for each to comment on and propose revisions. As the meetings neared, there were still some sticking points regarding the wording in the statement in regards to support for the “Free and Open Indo-Pacific Strategy”, and strong wording that Japan wanted included in the statement regarding North Korean tensions. Whole sentences were struck from the last draft before all members would vote affirmatively on the statement. According to FSM leadership, in the end the Declaration was a compromise for all countries involved but it was a declaration that could all stand behind. 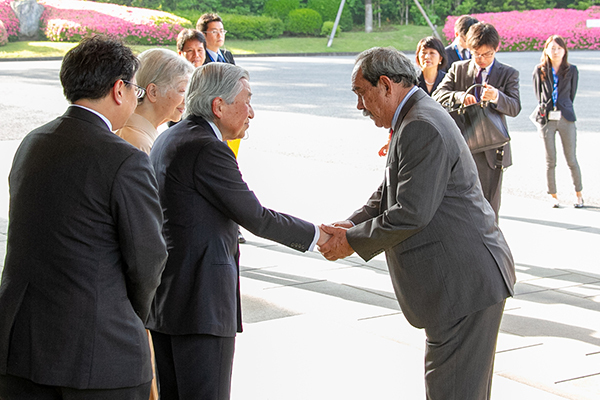 The full text of the PALM 8 Leader’s Declaration, which finished at 52 paragraphs, can be found at http://www.mofa.go.jp/a_o/ocn/page4e_000825.html. The leaders affirmed that long-term efforts to shape their partnership through the PALM process will be guided by a shared vision on four main pillars: maintaining stability through rules-based order, pursuit of enduring prosperity, strengthening the flow of and exchanges between peoples, and supporting regional cooperation and integration. The next main heading was “Maritime Order based on the Rule of Law, and Sustainability of Ocean Resources”. In it, the leaders underscored the importance of a free, open, and sustainable maritime order based on the rule of law in the Pacific and acknowledged that it will contribute to peace, stability, resilience, and prosperity of the region. With this in mind, the PIF leaders welcomed Japan’s active and constructive contribution to cooperation and development in the Pacific region, including through new initiatives such as its “Free and Open Indo-Pacific Strategy”. The FOIP strategy is built on three pillars: promotion and establishment of the rule of law and freedom of navigation; pursuit of economic prosperity through strengthening connectivity; and commitment to peace and stability such as cooperation in the fields of maritime safety and disaster risk reduction. The next main heading is “Strengthening the Basis for Resilient and Sustainable Development”. In it leaders reaffirmed their commitment to continuing cooperation towards the universal implementation of the 2030 Agenda for Sustainable Development, the “SIDS Accelerated Modalities of Action (S.A.M.O.A.) Pathway”, the Paris Agreement adopted on the UN Framework Convention on Climate Change, the Sendai Framework for Disaster Risk Reduction 2015-2030, and the Addis Abbaba Action Agenda on Financing for Development. They acknowledged the efforts by the PIF Members and regional agencies to progress the region’s implementation of these commitments through the Pacific Roadmap for Sustainable Development. They said that Climate Change is one of the most pressing contemporary security challenges, especially for island countries as stated in the Majuro Declaration, and that UN system, including the United Nations Security Council of which Japan was the President in 2017, should address those challenges. 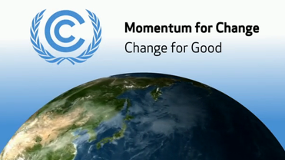 The Leaders expressed their intention to strengthen their leadership role in international negotiations to hold the increase in the global average temperature to well below 2 degrees Celsius about pre-industrial level and to pursue the efforts to limit the temperature increase to 1.5 degrees Celsius above pre-industrial levels. Discussion on various topics such as vulnerability of the Pacific region to natural disasters, sustainable development, management and conservation of the environment, the increasingly serious problems associated with shipwrecks and unexploded ordinance from World War II, solid waste management, health and medical services, and tourism development were discussed under this main section. 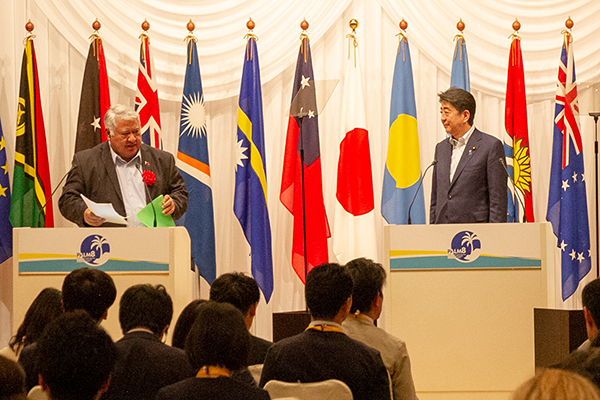 The Leaders thanked Japan for its ongoing support of Pacific Island Countries in all of those areas and others. The next main heading in the lengthy Declaration was “Connecting Pacific Citizens”. In it the Leaders discussed the importance of people to people exchanged within the region to foster understanding and to share strengths. 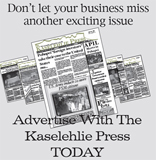 They expressed support for a third flight service to Narita via Federated States of Micronesia by Papua New Guinea. The PIC Leaders welcomed the decision by Japan to introduce multiple entry visas in relation to all of the PICs. PM Abe expressed his appreciation for continuing cooperation of PIC leaders to continue cooperation to address issues related to their shared past including repatriation of the remains of war dead from World War II, clearance of unexploded ordinance, and maintenance of government-built monuments for the war dead as appropriate. During the PALM 7, Japan committed to sponsoring 4000 people to people exchanges between PICs and Japan. They met that commitment and have now committed to that opportunity for 5000 exchanges within the next three years. The next main heading was “Cooperation in the International Arena”. Prime Minister Abe expressed support for PICs increasing presence in the international arena, including the upcoming Asia-Pacific Economic Cooperation (APEC) Economic Leaders Meeting to be hosted by Papua New Guinea along with other international meetings in the region. Among other issues, leaders underlined their commitment to seeking further cooperation to address transnational security challenges, including nuclear disarmament, non-proliferation and counter-proliferation, illicit trade in conventional weapons, terrorism and other transnational organized crime, violent extremism and cyber security. The last main heading of the Declaration was “Cooperation Activity during PALM 8 period. Prime Minister Abe said that Japan had fulfilled its PALM 7 pledge by providing more than 55 billion Yen (approximately $495 million USD), and implementing human resource development and people-to-people exchanges of 4,000 people with the PICs over the last three years. Though at PALM 8, the Prime Minister did not commit to a specific dollar amount as he did three years ago, he announced Japan’s commitment to “continuing implementation of robust development assistance as before, in keeping with the achievement” of the prior three years. He increased the commitment for people-to-people exchanges over the next three years to 5000. The PALM leaders will hold a Ministerial Interim meeting in a year in a half that will be hosted by one of the PIC. The timing and venue for PALM 9 will be determined at that time.